Come join the Le Peep® family today! the beauty of the le peep Concept is simplicity. Fresh as the day it was conceived. Superior quality. Reasonable Prices. Excellent perceived value. Far from "fast food". Le Peep® meals are always satisfying and nutritious. A proven approach to management. A creative approach to an evolving menu. And operating standards as strict as your mom's. That's what keeps Le Peep®... Le Peep®. Managers and staff enjoy working at Le Peep®. They work with smiles and pride. Le Peep® has a special effect on the public, too. Customers return repeatedly, regulars bringing friends, discovering the charm of a homelike setting where conversation and business flow together easily. Le Peep® is a philosophy. Le Peep® is a proven food service package. Le Peep® is one great meal after another. Developed, tested, then presented to an appreciative public. 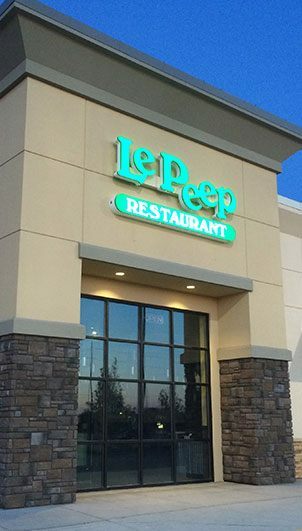 Le Peep® is that extra special eating experience the public calls "a real find." Even the hardest to please newspaper, radio and television food critics rate Le Peep® "The Best in Town" - Town-after- Town. What a concept. What a difference. What a perfectly mouth-watering opportunity for the discriminating restaurateur or developer. 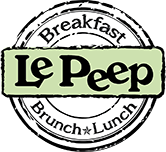 After 25 years with the company, I am proud to be the President and CEO of Le Peep®, a company that has been and continues to be the forerunner in the breakfast and lunch segment. We are the original and best breakfast and lunch restaurant chain and have been setting a standard in this segment for over four decades. We use the freshest and highest quality of ingredients. We take pride in treating our guests with the best and warmest hospitality, to recreate that feeling like they are at a family member's house. I am dedicated to continuing the great tradition of success and innovative ideas. If this concept and my goals sound like what you are looking for and you want to be a part of our family and enjoy the Le Peep® life style with me, you may just find your place as a licensee. We look forward to hearing from you!